With this odd introduction, the handsome Cambodian with the Chiclet teeth shadowed our dusty trek down the stretch of landscape that connects the Cambodian town of Poipet to the Thai settlement of Aranyaprathet, a barren wasteland where beggars and touts compete in an outdoor gauntlet of destitution and opportunity. Determined to travel around the world overland, we rejected the one-hour flight from Bangkok and opted to hire a private car to Siem Reap. Shielding my eyes while shooing away flies, I jealously traced the jet trail above, and questioned the wisdom of this decision. Arriving at Cambodian immigration, we cheerfully surveyed the solitary official on duty. “Three days for a visa. It’s very busy,” gloomily warned our friend. The bureaucrat ploddingly worked his way through a pile of documents as if they were his life savings and his office mate was a kleptomaniac. More incredible was the stack itself, since we were the only people at the window. Rolling my eyes while digging in my pocket, we quickly accepted. Grabbing our passports and 300 Baht, he side stepped into the room and slid them on top the pile. Never looking up, the official lazily stamped our documents, and passed them back. Expecting to pay between thirty-five and sixty US dollars for the three-hour private car to Siem Reap, we negotiated a price of forty-five dollars. I half expected our friend to whip out a paper and have me initial a box declining Mafia protection. Popping the trunk, a woman filled the propane tanks, wiped the dust from the rusty scale, and charged the driver the difference. For the next three hours, the vehicle vibrated like those funny chairs you sit in at the county fair to rejuvenate your feet, as we sped down the washboard-surfaced road to Siem Reap. Every spoken word stuttered from our lips as we slalomed around cars and skirted bone-jarring potholes. Periodically, our driver skidded to a stop for a smoke and we exited the car as if alighting on the planet Mars, a gigantic orb of reddish dust swirling as it settled back to earth. Unexpectedly, we slid to a stop on the outskirts of Siem Reap. Exchanging heated words and a fistful of money, the drivers negotiated our exchange into another car. Giggling like a couple of freed hostages, we concluded that Tony Soprano controls the transport hub in this city. Arriving at our hotel, we exchanged the dusty countryside for an apparent oasis. Still, I could not shake the spasms introduced on our three-hour ride. Siem Reap was blazing hot. Coupling 100% humidity with 100-degree temperatures, our energy evaporated faster than Lehman Brothers stock. Next to our hotel, an ominous sign at the hospital appealed for blood due to an outbreak of dengue fever, a painful affliction caused by daytime mosquitoes. Although the Center for Disease Control (CDC) maintains Siem Reap is safe, all of Cambodia is a malarial zone. This is not the place to end up in a hospital. Downtown Siem Reap has an inviting mix of restaurants and teems with Westerners every evening along Bar Street. Approaching two million visitors a year, its expanding list of accommodations range from two-dollar hostels to five hundred dollar resorts. Everything is priced in US dollars – even the ATMs spit out crisp US twenties. 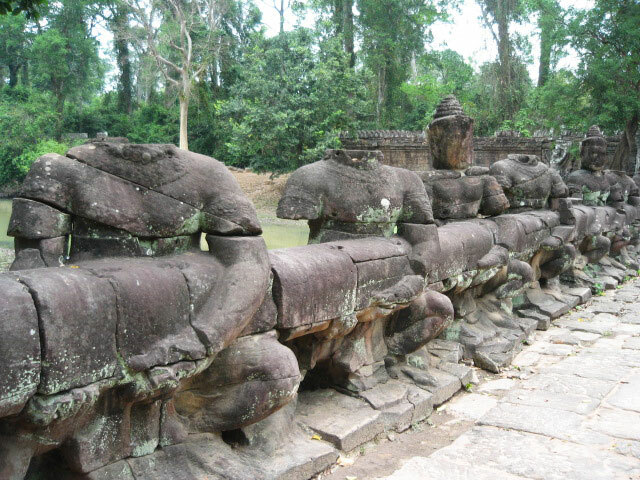 Dating from the sixth century, Siem Reap commemorates the Khmer Empire victory over Thailand. Populated with dozens of temple ruins that blend aspects of both Buddhism and Hinduism, the Angkor Archaeological Park is a UNESCO World Heritage site. What is your temple threshold? For many, the ‘Grand Circle’ of Angkor Wat, Angkor Thom, and Ta Prohm in a single day will suffice. Perhaps just Angkor Wat will satiate your appetite. We thought the three-day ticket offered a leisure pace with the opportunity to investigate less visited ruins. With this option, you will not feel rushed. 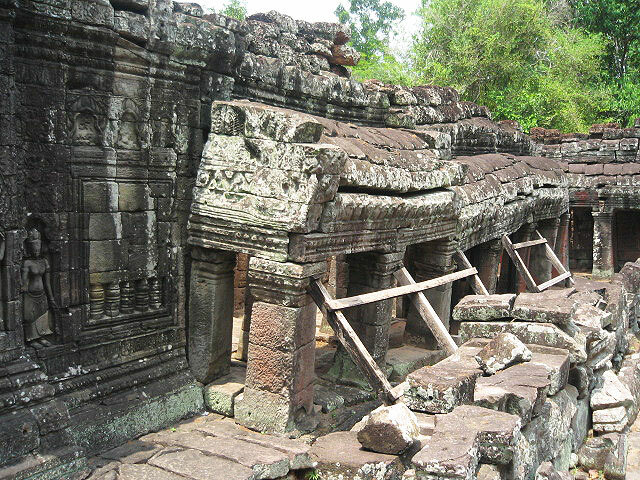 Approached from well-established roads, the eight-hundred-year-old temples are in poor condition. Challenging their inevitable collapse, angled timbers bolster disintegrating walls, brawny beams buttress collapsing archways, and bands of steel envelop stone pillars. Resist the beckoning of Lara Croft from the dark, eroded tunnel and do not trespass beyond the warning signs. Undoubtedly, the first five English words any young Cambodian learns are ‘Madame,’ ‘Mister,’ ‘buy,’ ‘postcard,’ and ‘water,’ since at every temple entrance, cute but persistent kids pepper you with a sales pitch, their parents lurking in the shadows ready to replenish their inventory. For the next three days, Mr. Sony was our personal valet, appearing at the hotel every morning at 8:00 AM sharp. Before we left his care, he vigorously pointed to the tree where we should meet upon our return. Dating back to the middle 12th century, the centerpiece of Siem Reap is Angkor Wat, built by King Suryavarman II as a monument to the Hindu god Vishnu. The world’s largest religious monument, bearded lions safeguard your passage across the moat, with the causeway assembled like a jigsaw puzzle from irregular blocks of stone. As you enter the walled compound, iconic lotus spires soar in the distance as an elevated pavement invites you towards the inner sanctum. Intricate bas-relief carvings detail scenes from Hindu mythology, including the legendary ‘Churning of the Sea,’ polished smooth from the touch of strangers. 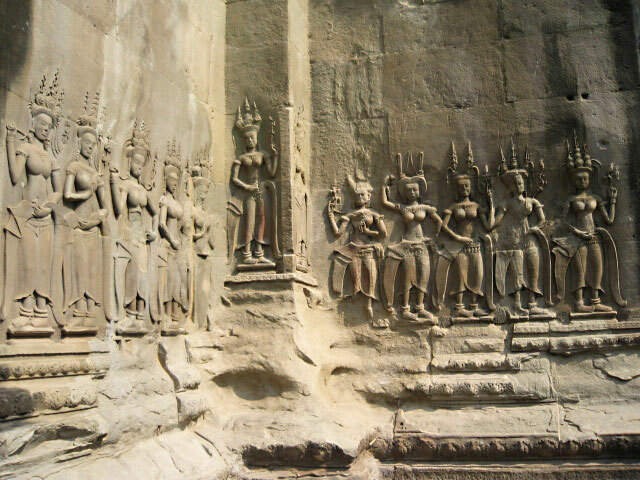 Nearby is the former capital of Angkor Thom, built by King Jayavarman VII in the early 13th century. Bayon, with its thirty-seven towers and giant stone faces that mysteriously follow your movements, Baphuon, the 11th century collapsed temple-mountain, the crumbling sandstone pyramid of Phimeanakas, and the recently excavated Terrace of the Leper King. On the perimeter is the Elephant Terrace, a thousand-foot-long wall emblazoned with elephants and half-human, half-bird garudas. Each of the four entrance gates has unique stonework, my favorite being Hindu gods in a never-ending tug of war with spirits from the other world. 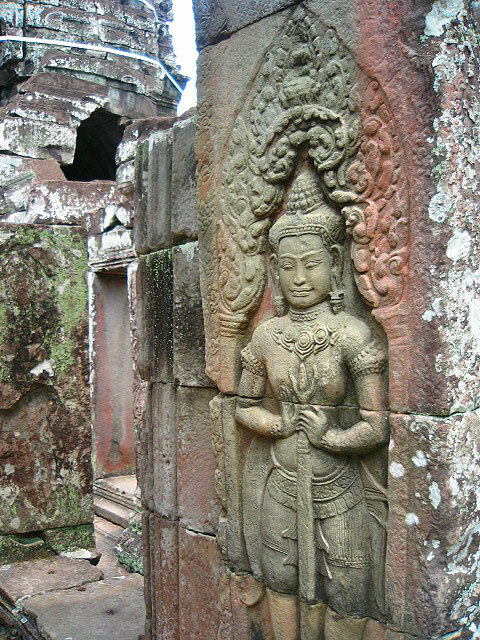 Jayavarman VII also built the Buddhist complex of Ta Prohm in the early 13th century. 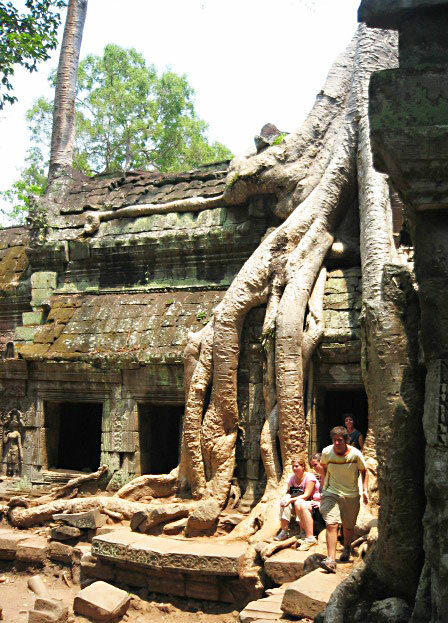 For centuries, massive fig trees have grappled the fragile ruins to a stalemate, producing a photogenic jungle within a temple. Here roots encase and cleave the walls, as dark corridors entice visitors to sunlit plazas. Piles of rubble attest to ongoing deterioration, as columns of bricks tilt precariously and signs caution explorers to avoid certain passages. Rounding each corner raised the expectation of crossing paths with Indiana Jones. In America, yellow warning tape would criss-cross this ruin like a CSI crime scene. 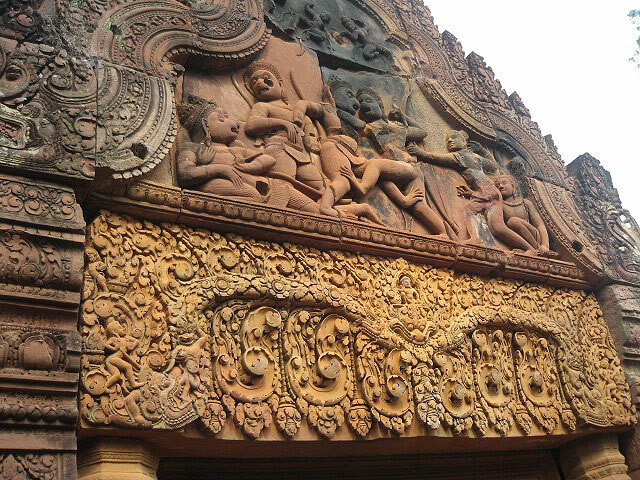 My favorite ruins are located twenty kilometers north of Siem Reap at Banteay Srei (“Citadel of the Women”). Seemingly scaled for a child, its diminutive dimensions will surprise you, as if built for a kid’s playhouse. Crafted by female artisans, every available surface of the hardened pink sandstone retains the sharpness of the extraordinary, delicate carvings. On the road back from Banteay Srei, we stopped at the controversial Cambodian Land Mine Museum. A cat with nine lives has nothing on the founder, the nerves of steel Aki Ra, who has allegedly defused 50,000 mines in his lifetime. Gazing upon the rusty pile of explosives piled behind the plastic walls, I prayed he did not miss one. 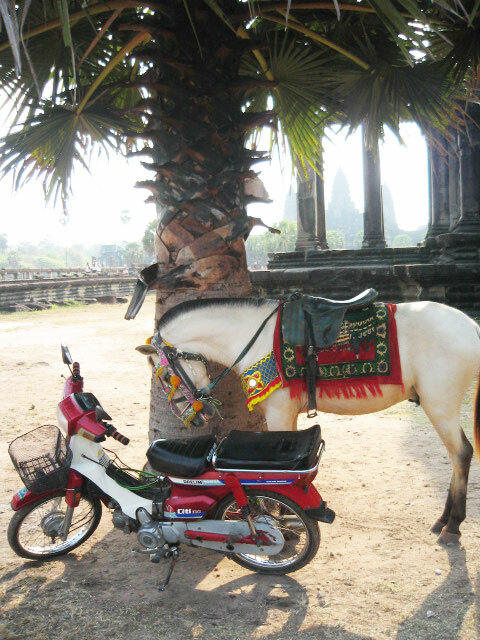 Tapping Mr. Sony on the shoulder, I asked to stop one last time at Angkor Wat before returning to our hotel. As the sun struggled through the haze on its way towards the horizon, the copper stained moat ignited into an orange spectacle. 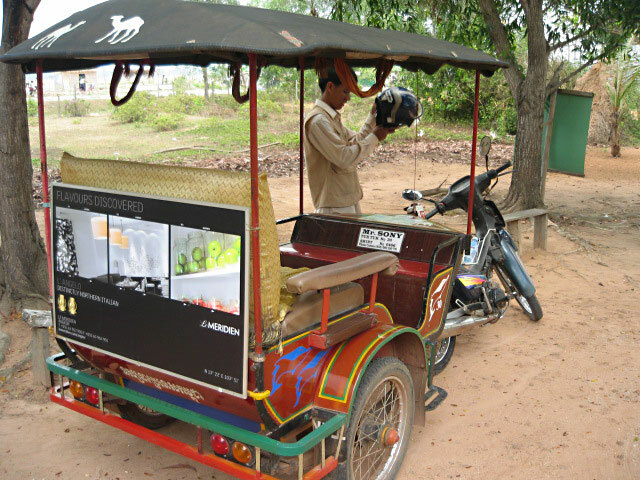 “Hope Siem Reap enjoyed you,” beamed Mr. Sony in his fractured phrasing as he dropped us off. Created centuries ago to honor the gods, the temples of Siem Reap are testaments to excellence that have endured despite wars and fractured political alliances. Glorious and inspiring, Siem Reap is highly recommended, although next time I will fly. 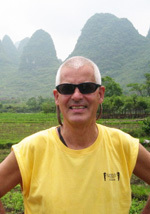 Bill Pfeffer has recently returned from a thirteen-month trip around the world overland journey. He lives in Northern California, and is a successful artist and aspiring travel writer. Bill Pfeffer was born and raised in Manitowoc, Wisconsin, along the shores of Lake Michigan. After graduating from the University of Wisconsin with a degree in Economics he moved to California. He is a plein-air oil painter of landscapes and seascapes, preferring to paint on location under the pressure of changing light and weather, so as not to deliberate so much over each and every stroke of paint. He has painted every beach scene along the Sonoma coast, his favorite location for spending the day. He and his wife Marge enjoy traveling around the world.